When it comes to movies he’s written and directed, Ben Affleck’s track record is one of the strongest in recent years. Movies like The Town, Gone Baby Gone, and Argo have enough intensity and depth to be remembered a hundred times over. When I saw his next project, Live by Night, was going to be a Prohibition era gangster movie, I was good to go. I’ve been looking forward to this movie after seeing the very first trailer for it months ago, and I felt even more hopeful when I saw that it was based on a novel by Dennis Lehane, who also wrote the novel Gone Baby Gone. Now, while there are plenty of really great things in this movie that are worth mentioning and getting excited about, Live by Night is probably the weakest entry in Affleck’s directing filmography. 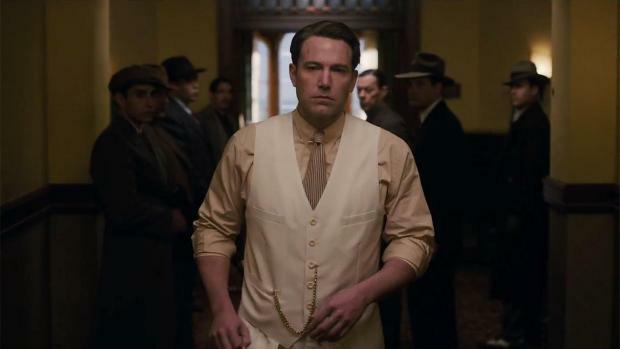 Joe Coughlin (Ben Affleck) is a World War I veteran who makes his small living through crime as a thief. He’s also madly in love with a woman named Emma (Sienna Miller), the wife of his boss and and head of the Irish Gang of Boston, Albert White (Robert Glenister). After this affair almost gets him killed and results in him losing Emma, Joe joins forces with Italian mafia boss and enemy of White Maso Pescatore (Remo Girone). Pescatore sends Joe to the Ybor City in Florida to help run his rum importing business that is being threatened by White. While in Florida, Joe falls in love and marries Graciela (Zoe Saldana), who is a major component of the importing business. Not everything goes smoothly however as rival factions, a tragic run in with the local sheriff and his daughter (Chris Cooper and Elle Fanning), and the looming danger of the Ku Klux Klan threaten this entire business, which forces Joe to become the violent man he never wanted to be again. I have really mixed feelings about this movie that came up as I was writing the summary. It reminded me the biggest flaw that this movie has, and that is that there is so much crammed into a run time that barely has the ability to hold it all. There is around 3 and a half hours worth of material here that’s forced to fit in a movie that’s only a little bit over 2 hours. This makes for some weird pacing, plot lines that don’t get enough attention, and some characters that unfortunately lack enough development. Let’s start with the pacing of the movie. A lot of times when someone’s talking about the pace of a movie, they’re going to say how slow it felt. On the flip side of that, I felt like Live by Night went way too fast. There was a part in the middle where it slowed down to a crawl, but then picked up so fast I thought it was going to break my neck. This is what happens when there are at least five different main plots happening in a movie. Let’s look at the positives for a bit because this movie does have very cool elements. Affleck has shown us time and again that he is capable of filming a beautiful looking movie, and Live by Night holds up to that standard. The color pallets and sweeping camera work got the better of me at times and I just had to watch in awe at how amazing everything looked. This also a movie with incredible sound design. Every gunshot felt authentic and blasted through the theater’s sound system for optimal escapist effect. Speaking of sounds, Harry Gregson-Williams’ score is absolutely fantastic. Finally, this movie handles violence in a very interesting way that I’ve been seeing more in movies as of late. The violence is strong but the scenes of it are few and far between. Instead of making the violence look cinematic and fake, there’s this realism to it that really hit me as I was watching it, and reminded me a lot of how Affleck handled it in The Town. While that’s all well and good and does make the movie memorable in its own right, I still can’t help shake the fact that as time has gone on I’ve become less and less impressed by this movie. A big reason is because of the characterization and how the people in the movie develop. My biggest example of this is the relationship between Joe and Graciela. It has the potential to be a great cinematic romance, but it unfortunately isn’t explored enough and the events of their life jut kind of happen and then time moves on because there is so much left to cover. The same can be said about Joe’s partner in the movie. We briefly see him in the first third, then he’s reintroduced, but their relationship doesn’t really have a chance to go anywhere either. I’ve been so excited for Live by Night, it kinda hurts to say that it disappointed me. It’s a beautiful looking movie with a great score and sound design. There’s also plenty of great actors giving quality performances. The problem is that so much is crammed into the movie that some plots are wasted and characters fail to develop fully which lessens the dramatic impacts of some scenes. 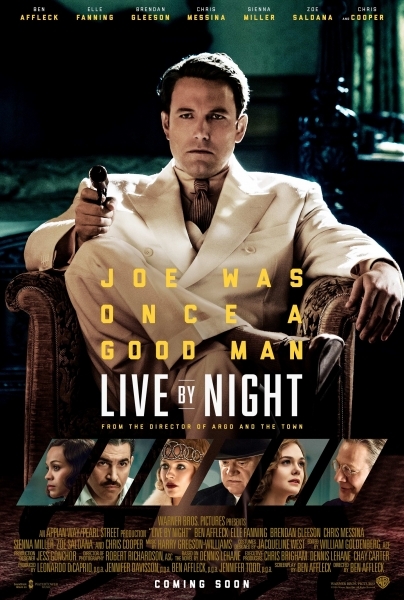 I really wanted Live by Night to be great, but it’s a movie that fails to live to its fullest potential and I’m not sure I have any reason to see it again. I’ve seen plenty of new movies this year, each with various degrees of emotion, suspense, and tension. Looking back on everything I’ve seen, I can honestly say that Sicario is the most intense film I have seen and probably will see all year. 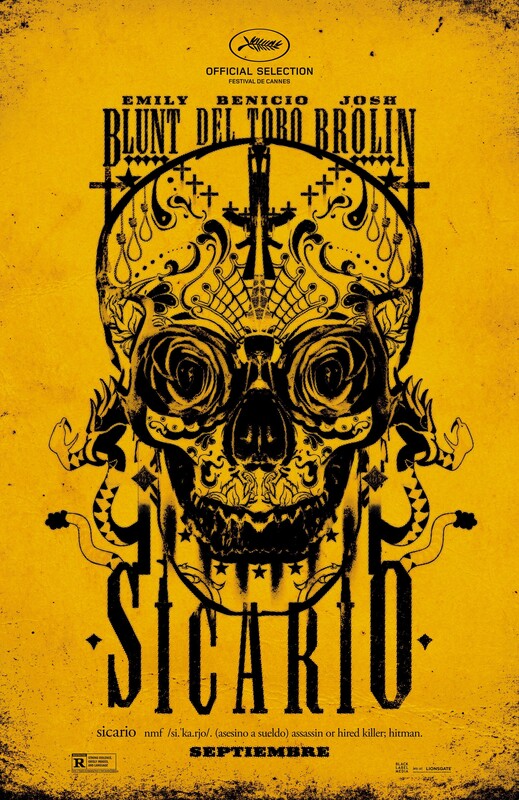 Directed by Denis Villeneuve (Prisoners and Enemy), written by Taylor Sheridan (known for a performance on Sons of Anarchy), and filmed by Roger Deakins (who worked with Velleneuve and on many of the Coen Brothers’ films), Sicario not only looks beautiful and offers a very powerful and realistic story, it also features strong performances from all its actors. 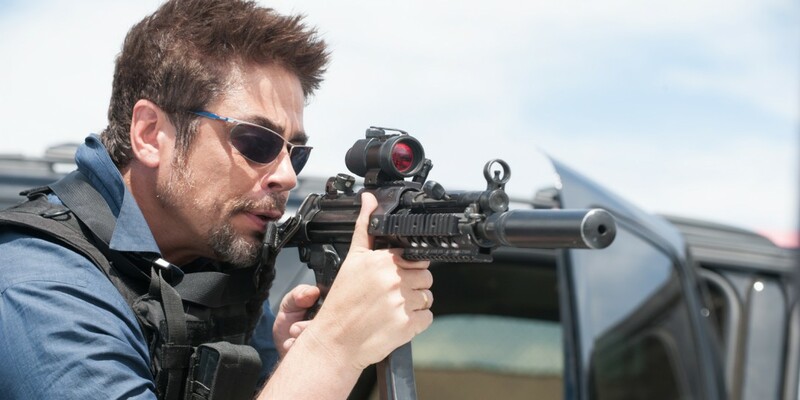 Sicario is definitely a stand out film of 2015. Kate Macer (Emily Blunt) is a young FBI agent with a bright future ahead of her. After a terrifying encounter with murderous members of the cartel, Macer is recruited by mysterious government agent Matt Graver (Josh Brolin) to be part of a strike force aimed at crippling those responsible. She soon meets Graver’s partner Alejandro (Benicio del Toro), who she can’t quite place on any particular side or agency, making him the wild card of the team. After joining this special operations team, Macer is plunged into the violent world of the Mexican drug trade where the reprehensible violence is done by the cartel as well as the Americans she is working for, and soon clear right and wrong becomes indistinguishable. Sicario very much reminds me of Steven Soderbergh’s Traffic from 2000. Both films show the realities of the drug trade and the lives that are affected by all of the violence. While Traffic is most certainly unapologetic, Sicario feels like a behind the scenes look at something we’re not supposed to see. There’s crime, lies, torture, and murder on both sides of the spectrum, which forces the audience to find logic in the lesser of two evils. This isn’t really a film that will allow you to kick back and relax for a few hours. There is way too much thought that has to be put into the story and characters, plus it’s just way too stressful. There’s a scene in Sicario where the special forces team is attempting to cross the Bridge of the Americas to get back into the United States. The only problem is that they are caught in a gridlock and are surrounded by a few cars filled with cartel members. Instead of creating what could’ve been a run of the mill action sequence, Villeneuve and Sheridan create an incredibly suspenseful and low key scene that explodes in only a few seconds of realistic violence. This scene is the best example of the tension that this movie creates. Never does anything in this movie seem overblown or unnecessary. This also means that there is a lot of down time between missions that the team goes on, which may seem boring, but remember that this film is striving for realism. Even though Sicario strives to paint an accurate portrait reality, never does it forget that it is still a movie and requires time for cinematic drama and character development. Sheridan’s screenplay is very down to earth and all of the actors play their parts very well. Emily Blunt and Benicio del Toro especially stand out as the scene stealers of this movie. Deakins’ cinematography is as beautiful as ever and deserves a possible Oscar nom when all is said and done. Speaking of Oscar noms, Jóhann Jóhannsson’s score is haunting and is certainly the best music I’ve heard in a movie all year. Sicario is an unforgettable movie experience that feels like it sometimes bends the rulers of modern film making in order to create a unique story with real characters and situations. There have been a lot of great movies that came out this year, and this film stands up there in the upper echelons of my favorites of 2015. It can be difficult and unsettling at points, but it feels so authentic that it should be required viewing for anyone who loves movies. The 1930s was an interesting time in American history. The Great Depression hit in 1929 which forced many people to make money to provide for themselves by any means necessary. Since this was happening during the time of Prohibition, a lot of these people used the demand of alcohol to their advantage. One of the biggest names was Al Capone, who built an entire empire and was one of the forerunners of organized crime in the United States. This leads me into Brian De Palma’s 1987 film The Untouchables, based on a book of the same name and a television show from the 1950s. With source material like this, it’s no surprise that this film has become one of the most respected gangster movies of all time and, I think, Brian De Palma’s best film. In the early 1930s, Al Capone (Robert De Niro) practically runs the city of Chicago and makes millions of dollars through the illegal distribution of alcohol. He’s also a dangerous and violent criminal who uses intimidation and murder to force people into doing business with him. 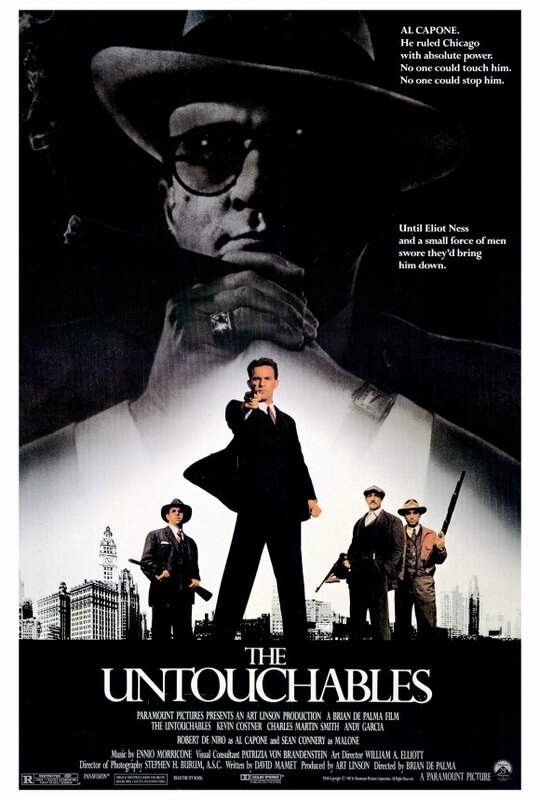 This causes the Bureau of Prohibition to create a task force just to bring him down and choose Eliot Ness (Kevin Costner) to be the head of this group. Ness finds working with a whole task force to be dangerous and nearly impossible, so he makes up a team all his own. They are beat cop Malone (Sean Connery), new recruit George Stone (Andy Garcia), and accountant Oscar Wallace (Charles Martin Smith). The group is soon nicknamed “The Untouchables,” but they soon realize that’s not true as the pressure they put on Capone force him to put the pressure back on them. I hate it when critics use the word “captivating” to describe a movie. It’s such a cheesy adjective and I simply don’t like it, but allow me to be a hypocrite just this once. The Untouchables is a captivating movie. Everything just comes together so well to make a movie that reminds me why I love movies so much in the first place. Normally I hate when a movie is based off true events and is completely inaccurate, but David Mamet’s screenplay makes me forget all that and just enjoy the story that he put together. With Mamet’s screenplay, Brian De Palma’s expert hand at directing, the cast, and Ennio Morricone’s note perfect and unique score, The Untouchables was practically sculpted by the gods. There’s a lot of great actors attached to this movie like Kevin Costner, Sean Connery, Robert De Niro, and Andy Garcia. While everyone does a fine job, there are a few stand out performances that exceed great and wind up in the territory of excellence. These exceptions are Sean Connery and Robert De Niro. Now, De Niro isn’t really surprising, but I never really looked at Connery as a great actor. He can act fine, but his performance in The Untouchables is the highlight of his talent. He brings humor and the right amount of sincerity and drama to the role of Malone, which makes this movie worth watching just to see him act. D Niro, on the other hand, while not being in the movie all that much, makes every scene that he’s in memorable. He plays Al Capone with viciousness, slime, and makes him a very entertaining person to watch. Like I said before, this movie is pretty far from being accurate. For example, Eliot Ness and Al Capone never actually met face to face during the whole ordeal, and Capone never actually violently attacked back. Also, Frank Nitti wasn’t involved in things like he was in this movie. But, this movie presents a stylized version of reality that makes it so hard to look away. Brian De Palma is known for making highly stylized, but not over the top films. There are scenes in this movie that will be remembered until the day I die, like the shootout on the bridge and the slow motion gunfight in the train station. These scenes combined with Morricone’s score just get to me in ways that movies should. Brian De Palma’s filmography has had some rough patches, but also some that define film making perfectly. I love Scarface just as much as the next guy, but when it comes to mob movies that De Palma has done, my favorite has to be The Untouchables. It tells a story so perfectly with characters and their arcs so defined, that it’s easy to care about what happens to all of them. It also is reality through a stylish looking glass that shows a world like our own, but somehow just a little different. That’s the magic of the movies, and that’s why this film is a must see. Sometimes it’s great to sit down and watch a movie that really challenges me. A movie that has complex art design and intricate storytelling that weaves in many thematic and moral questions while telling a story that’s wholly original and moving. Then there’s times where I want to sit down, switch my brain off, and just take a ride. That’s exactly what I wanted with The City of Violence and that’s exactly what I got. This movie isn’t difficult or all that original, but it is a whole lot of fun, but it could definitely have used a little bit more work in the story and character department. When ex-gangster Wang-jae (Ahn Gil-kang) is murdered, three of his closest friends are reunited in their hometown for the funeral. Tae-su (Jung Doo-hong) is a cop from Seoul known for his controversial no nonsense attitude, Pil-ho (Lee Beom-soo) is the gangster that took over Wang-jae’s place, and Seok-hwan (played by director Ryoo Seung-wan) is the youngest of the three working as a debt collector. 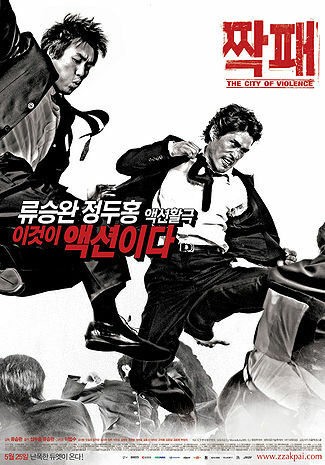 Tae-su and Seok-hwan are both hell bent on getting revenge for the murder of their friend and soon find themselves working together, turning the city upside down and blood red to find who are responsible. When it becomes evident that Pil-ho had something to do with the murder, the two investigators engage in a head on collision with one of their closest childhood friends. So, really there isn’t too much to The City of Violence. It’s a pretty standard revenge movie, but definitely has some elements that make it memorable along with some problems as well. For one thing, it is extremely generic, and while that isn’t a huge detraction, it is worth mentioning. Another problem is that the movie didn’t have any sense of time or character development. Time seemed to move without cluing me in to how much time has passed or where I was. The characters are also incredibly bland. Like, blaaaaand. Not only that, but they also don’t develop at all. They are exactly how they were at the beginning of the movie, save for a few minor changes. For a story about revenge, I didn’t feel a strong sense of motivation coming from the characters. Things seemed to just be happening. 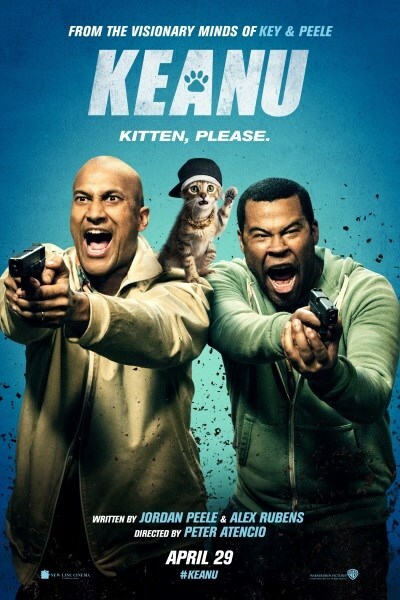 What I can say about this movie is that the action is fantastic. There are points where it felt like I was watching a video game, as many of the best martial arts movies make me feel. Seeing two guys throw down with an entire crowd of bad guys is just entertaining to watch. 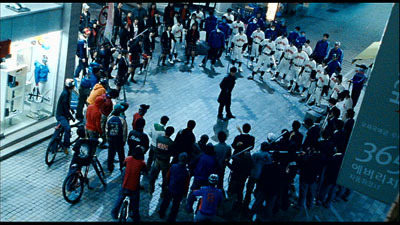 One scene that takes place in an alley with a whole bunch of different gangs is particularly memorable, especially since one of the gangs is based off of the Baseball Furies from The Warriors. There is so much destruction, both physically and environmentally, in every fight that it made each extended sequence feel exciting. Another problem I have with this movie actually happened after I was done the movie. Yes, the movie has a good bad guy and exciting fight sequences, but there’s a lot of the movie that I don’t really remember too vividly because it isn’t anything special. As I’ve been thinking more and more about this movie, the less and less I really enjoy it. Part of the fun of watching a movie is the way that it makes you feel and think afterwards. Points go to a movie that makes me excited to talk about it and share it, but I don’t feel that way with The City of Violence. It’s more of a movie that you watch but then don’t really have anything to say about it in the days to come, which hurts a movie just as much as poor writing or acting. The City of Violence isn’t a bad movie, in fact it’s a pretty good one. While I was watching it, I was really involved with what I was watching because it moved so fast and had great action sequences and characters that I recognized. What made it less enjoyable is the lack of development the story and the characters go through. Like I said before, things seem to just be happening. There’s plenty of style to enjoy, but sometimes that even becomes a bit too much. For martial arts fans, it’s definitely one to check out at least once, but I don’t think it’s going to be one that sticks with you forever. I remember sitting in my friend’s basement one night and we came across this movie playing on t.v. called Fresh. We had no idea what it was, but it seemed interesting enough. Little did we know that this movie was going to get seared into our minds and stick with us to this very day. There are plenty of movies that explore urban life, but none of them I think have come close to this debut film by Boaz Yakin. It’s gritty, emotional, and just really packs a punch that anyone who has seen this will agree exists. Fresh (Sean Nelson) is a 12 year old kid living the best way that he can on the streets. When he’s not in school, he can be seen running drugs for low level kingpins Corky (Ron Brice) and Esteban (Giancarlo Esposito). He can also be found in the park with his estranged father Sam (Samuel L. Jackson) who teaches his the strict rules of playing and mastering chess. Fresh is a smart kid, way too smart for the situation that he’s in, so when he witness a tragic shooting at the local basketball courts, Fresh begins concocting an elaborate game of “street chess” complete with his own human pawns, sacrifices, and ultimate victories. If he’s lucky, this will get him and his drug addicted sister (N’Bushe Wright) off the streets and safely hidden away. This movie smacks you in the face harder than you could ever expect, but it also has a really intriguing story behind it. It’s not hard to find an urban movie about adults trying to survive, but finding one where it’s all seen through the eyes of a kid is much more impactful. Not only is he a kid, though, he’s a kid who’s way smarter than everybody else. It’s awesome seeing this kid stay one step ahead of the adults who are slowly but surely leading him to the grave. 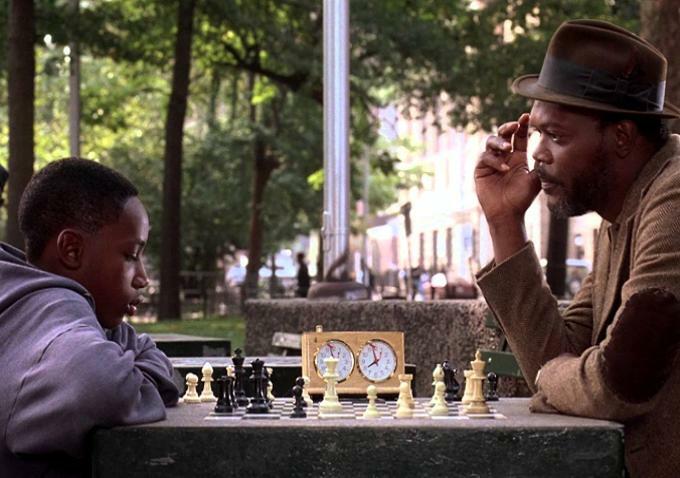 Then when you think of the movie as a real life game of chess, things get even more fun because you can sort of see the moves that he would be doing if it were on a board and he was in the park playing with his dad. Another really cool thing about Fresh is how immersed into the environment you can become. Every location is chosen to perfection to illustrate all the different aspects of life in the city, wether it’s in an upscale neighborhood, deserted landscapes, or the projects. As Fresh moves about the city, I felt like I was exploring different areas along with him to the point where the city almost becomes a character in the movie. When the environment in a movie can make you feel such emotion, it’s a clear sign that you’re watching a well made film, and Fresh is a perfect example. One thing I will say about this movie is that it may not appeal to everyone. This isn’t a movie for the faint of heart, in fact the first time I saw Fresh I felt pretty uncomfortable myself. What this movie has to offer is, what I think, a very realistic look at some really terrible things. Yes, this movie is violent, but it isn’t violence for the sake of violence. It’s handled in a very matter of fact yet startling way, and that’s what really makes the film so powerful and memorable. When movies exaggerate, it’s easy to remember that you’re just watching a movie. When a movie takes steps to be as realistic as possible, it’s much easier to get completely sucked into what you’re watching. 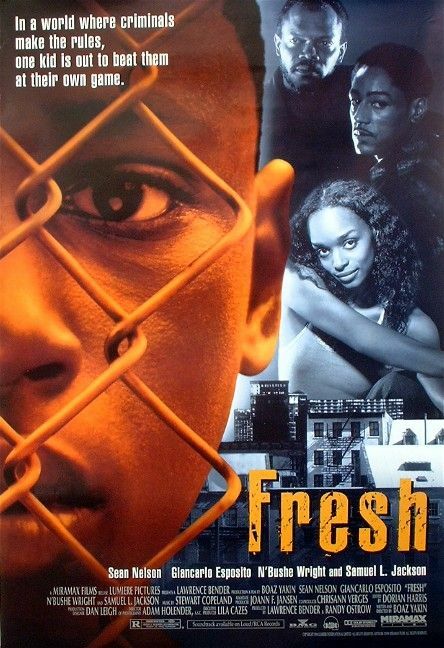 Fresh is one of the most memorable movies I’ve seen, and I’m surprised it isn’t recognized as a modern day classic. When it was first released, it was met with critical acclaim across the board, but now it seems to have sunk back into obscurity. This is a fantastic movie with images and scenes that will not be forgotten, at least for a very long time. If you feel like you can handle some realistic depictions of terrible things, I’d check out Fresh as soon as possible.